If you would like to be a vendor, please fill out the form online under events (click here) or print the application and mail check to the address indicated. 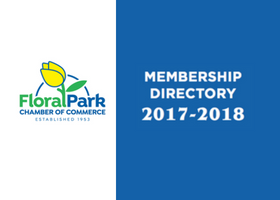 Please contact Dana at 516.641.1200 or email: info@floralparkchamber.org with any questions. In an effort to minimize its impact on your quality of life, the project’s construction team has implemented an outreach effort entitled “The Ambassador Program.” You now have your own point-of-contact who can provide you with the latest information on the project, and of equal importance, can quickly address your questions and concerns. For up-to-date information on the project, please visit our recently launched website at www.thirdtrackli.com. If you have additional questions or would like schedule a meeting, please email us at communityoutreach@3rdTC.com or call the project’s 24-hour Hotline at 516.203.4955. For more information, please go to our LIRR Project page. Chamber Member Survey - Your opinion matters! Thank you for your continued support of the Floral Park Chamber of Commerce. At the end of each year we reflect on the past year and rely on member feedback to create a strategy that will help our chamber continue to build a better business community in the year to come. Our Chamber Board of Directors has created a Google Survey to gather feedback from our local businesses. It's only a few questions that we would appreciate hearing from as many of you as possible! On Friday, October 19th, the Nassau County Chambers of Commerce of Long Island held their annual breakfast at The Crest Hollow Country Club honoring all of Long Islands business person of the year. Don't Miss Out On This Exciting Lunchean at The Belmont Racetrack overlooking the beautiful grounds. Bring your co-workers, family,friends and enjoy the day with us. What a great way to get ready for the Belmont Stakes in June!! Strategic Objectives: Promote a strong local economy; provide opportunities for relationship building, deliver programs to help business grow, enhance commerce through community stewardship. Organization: The chamber is an organization of business leaders who work to improve their community and the areas business climate. The volunteer board of directors governs the chamber. The effectiveness of the chamber is entirely dependent on member support & involvement. A staff of volunteers runs the day-to-day operations. Community Involvement: The chamber strengthens the community by identifying needs, problems & opportunities. It then develops programs to solve problems and satisfy the needs. The chamber regularly reviews its programs, to bring about a healthier climate in which business & the communities grow & prosper. Co-sponsoring Community Day with the town of Floral Park and NYRA is just one example.